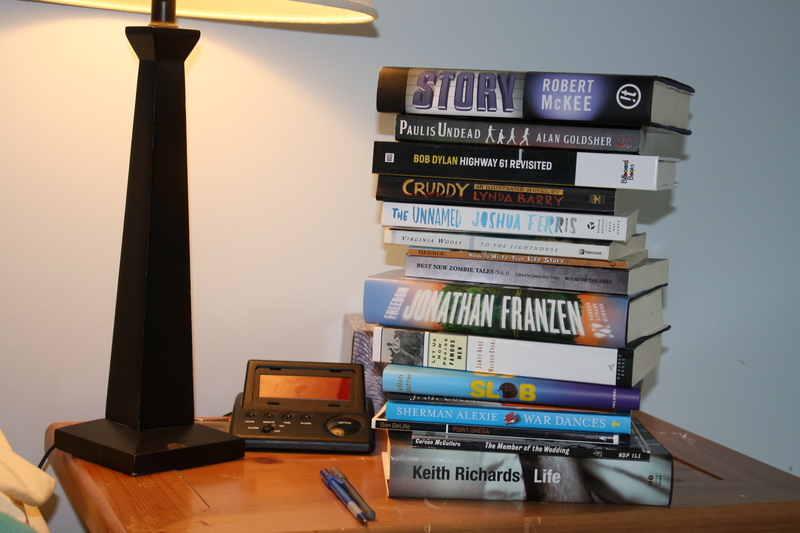 Many of us have a big stack of books that we hope to read. Sometimes there’s a plan, often it’s a spur of the moment grab. Here’s some of the titles I currently hope to get to — soon, someday, maybe never. STORY by Robert McKee — a book on the craft of writing, the dynamics of story. PAUL IS UNDEAD by Alan Goldsher — the Beatles as flesh-eating zombies, naturally. LEGENDARY SESSIONS: BOB DYLAN, HIGHWAY 61 REVISITED by Colin Irwin — the great artists always make me want to know more; and alas, with so many of today’s celebrities, we just want to know less. Much, much less. 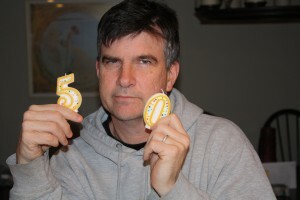 Charlie Sheen, I’m looking at you (and I don’t want to). CRUDDY by Lynda Barry — found this in a used bookstore. 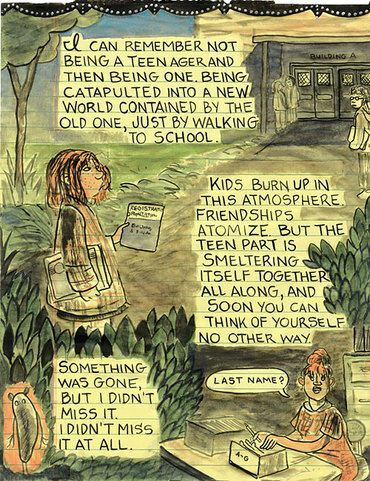 Lynda Barry is completely awesome, I revere her. A true artist. THE UNNAMED by Joshua Ferris — I enjoyed his previous book, Then We Came to the End. TO THE LIGHTHOUSE by Virginia Woolf — a classic that has slipped through the cracks. Okay, not cracks. The gaping holes in my education. HOW TO WRITE YOUR LIFE STORY by Ralph Fletcher — I loved Boy Writers, and really respect this man and all that he works to achieve. BEST NEW ZOMBIE TALES, VOL. 1 — a collection of stories, old and new, about zombies. I’m kind of maybe looking for inspiration here, ideas. No, I’m not writing a zombie book, exactly. FREEDOM: A NOVEL by Jonathan Franzen — feels like a mandatory read, a divisive book that people seem to either love or hate. No idea in which camp I’ll be. LET US NOW PRAISE FAMOUS MEN by James Agee — I just finished A Death in the Family and it blew me away. One of the best things I’ve read. Ever. SLOB by Ellen Potter — this book just keeps coming up on lists, over and over again. At a certain point, I take that as a sign: Somebody’s trying to tell me something. SUMMERTIME by J.M. Coetze — it’s been a while since I’ve read anything by Coetze, and this book fell into my hands. We’ll see. WAR DANCES by Sherman Alexie — curious about this one, the rag-tag format, the voice, the awards. POINT OMEGA by Don DeLillo — a great writer and a book I didn’t know about until I had it in my hands. I love, love, love a short book! THE MEMBER OF THE WEDDING by Carson McCullers — another used bookshop buy, a classic I haven’t read yet. LIFE by Keith Richards — should be a lot of fun, waiting for the right moment. I asked for this for my birthday and . . . got it! What birthday? The one that happened back on February 1st. Hey, it’s a Lynda Barry Rock Block. Two posts in a row! 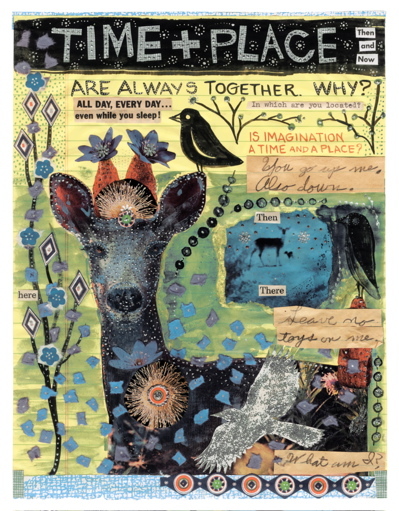 I found a great link to a Lynda Barry audio slide show at Julie Fortenberry’s Picture Book Illustration blog. Go here for the Barry link. Great stuff, under three minutes. You have the time. 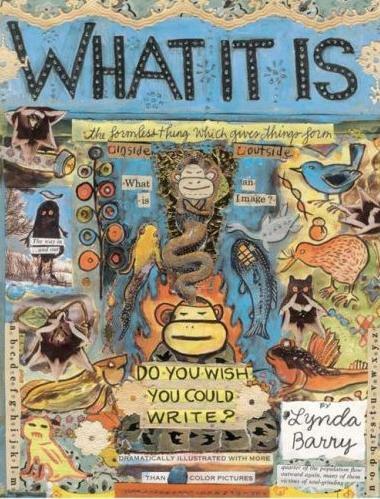 I think it’s time we talked about the supreme awesomeness of Lynda Barry . . .
. . . and maybe a little bit about why I love her most recent book, What It Is. I’m not practiced at writing reviews, but fortunately there’s already a ton of great material out there. I’ll bust out the links as we go, and you can get distracted just like me. Let me back up for a minute. Here I am, okay, it’s Monday and I’ve got a lot of work ahead of me. I’m trying to figure out a new book, so I started the day determined to FOCUS and CONCENTRATE (two excellent candidates for 2009 OLWs, if you haven’t grabbed one already). But here am I, DISTRACTED by Lynda Barry. Rather than resist it, however, I’m thinking maybe that’s the entire point of her book, of creativity itself. Or at least an aspect of it: That you can’t always direct creativity. And that maybe it’s absolutely the worst thing you could do, like attempting to “master” nature, when what you need to do is ride that wave. If I had a motto, it would be this: Follow Your Enthusiasms. Take that walk into the deep dark woods. And trust your instincts, even if you don’t know where you are going. So today it’s Lynda Barry. I can’t shake her out of my mind and I’m thinking that it’s wrong to try, like trying to push away a dream. 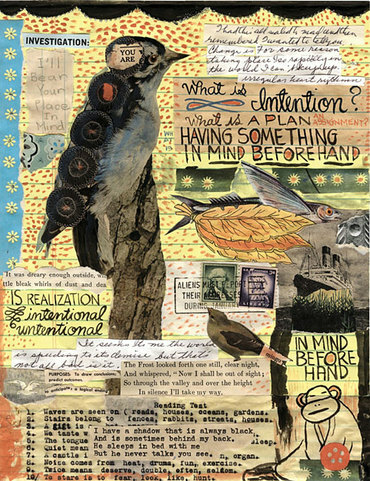 My distraction — this impulse I have today to “deal” with Lynda Barry’s work — to read her, watch her on youtube (genius clip beow! ), to think and read and write about her, may be feeding my soul. It might even be, strangely, helping me work on this unwritten book. It may be exactly what I need, because really, who knows what we need? 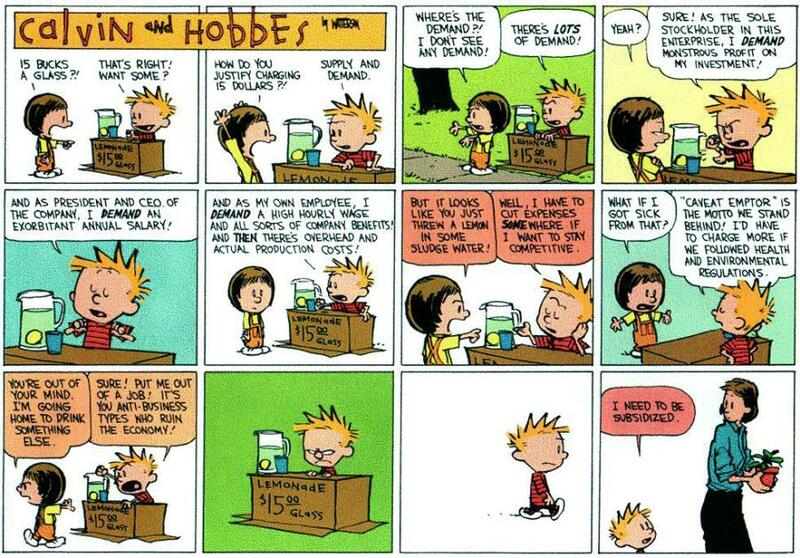 Or how “work” works? We only know what we want, or think we need, and often that may be the opposite of Need. I mean to ask, is this UNPRODUCTIVE? All I know is that I have to answer it, this tug. I am compelled to respond. I can’t and won’t push it away. And at the same time, I know that by doing this, writing about it, I will be able to get back to where I once belonged, start doing what I “need” to do. It is a dance between conscious motivation and the wellspring of unconsciousness. No matter how busy you are, it’s seriously bad Mojo to push away the things that inspire you. 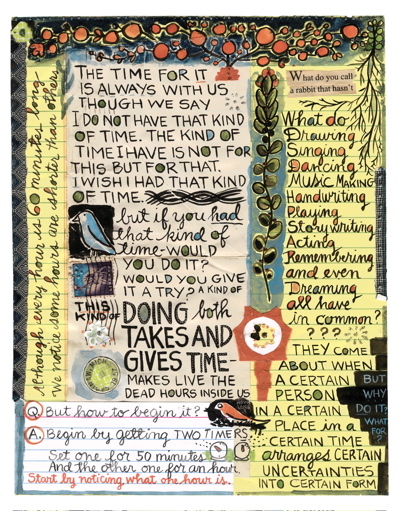 Every page of Lynda Barry’s book demands to be stared at lingeringly and lovingly. What It Is is nominally a book about writing rather than cartooning; it’s jumbled and digressive, occasionally vague on the details. Even so, it’s likely to be useful and even inspiring to anyone who wants to make comics, or any kind of narrative art, for that matter, because what it’s meant to serve isn’t the mechanics of creative work but the creative impulse itself. As a reader, and a writer, I’ve often sought out books that will feed my imagination. Books that inspire me. Books that I can use. And at the same time, when I’m writing, there are so many books that could get in the way, could stop me cold. Which is why a lot of writers don’t read novels when they are deep into working on a book. For example, I’m writing a school based-story, so I absolutely can’t go near anything by Andrew Clements. But this book, What It Is, well, that’s just food. It sustains me, urges me forward. It is not a “how to” book but, come to think of it, a “Do” book (which aligns nicely with my OLW for 2009). A book you want to close after reading dreaming through a few pages. A book that goads you into action. Now check out this three-minute clip from a bookstore talk. Isn’t she great? Don’t you love her? Aren’t you distracted and inspired and happy? I am. POSTSCRIPT: For more Lynda Barry goodness, click like crazy right here!